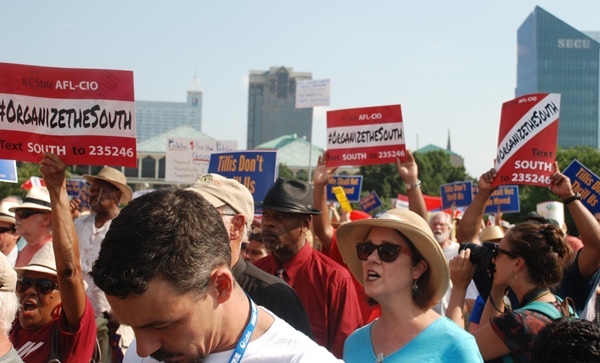 Thousands of demonstrators rallied outside the North Carolina Statehouse in Raleigh during a Moral Monday protest in June 2014. The Moral Monday Movement has concluded another series of protests to expose and challenge destructive laws in North Carolina. The #TalkUnion tour kicked off on Labor Day in downtown Raleigh where union and civil rights leaders rallied in support of a minimum wage increase and workers’ rights. The tour made stops in Greensboro and Charlotte. #TalkUnion came just days after seven consecutive days of action across the country – the first multi-state Moral Monday movement to date. Organizers from Alabama, Arkansas, Florida, Georgia, Indiana, Mississippi, New York, North Carolina, Ohio, Pennsylvania, Tennessee and Wisconsin gathered each day around common themes – labor rights, education, equality, women’s rights and health care. The week ended with a mass rally for voting rights on August 28, the 51st anniversary of the historic March on Washington. Moral Mondays began in 2013 as a grassroots response by the North Carolina NAACP to a sharp conservative turn in North Carolina’s political leadership.